Combine PC Gamer with Edge and Retro Gamer, and get one for free. This week, we're running an offer on PC Gamer subscriptions, where if you subscribe to two magazines, you get a third free. It's ideal if you're buying gifts for family members who might have different interests to you. Or if you want to read more about games each month, you can add two other great magazines to your order. You can see all the magazines on offer here. 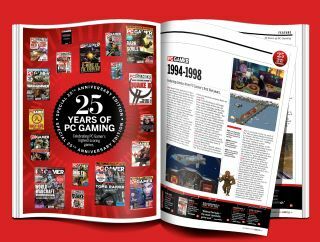 Might we recommend combining PC Gamer with Retro Gamer and Edge, if you're looking for the broadest possible spectrum of quality games coverage—you can read about old favourites and new games across all formats every month, if that's your sort of thing. You don't need to add a code to get this offer—with three subscriptions in your basket, it'll automatically discount the third (whichever is the lowest price) at checkout. All three subscriptions must be the same payment type and currency. The offer ends this Friday at 4PM. Note: For direct debit and continuous credit card subscriptions, the discount/offer will only be applied to the first payment.